Another lazy Monday, my brain refuses to function. The only bright spot was getting to prepare obento again. Seeing I bought 3 new bento boxes (thank gawd for the start of school season — the school year here starts in June), all cheap, but all lurvely. This particular one, I bought for 98PHP, that’s a little less than $2. It even comes with a little green bento belt. It’s a bit small, measuring just around 6″ lengthwise but it’s all right since I’m trying to eat less anyway. Anyway, let’s get to the food. The bottom tier features a new recipe I tried from one of my Japanese cookbooks, it’s a Tuna Kebab dish (the sticks are hidden under the tomatoes). I added cherry tomatoes and peas to balance it out, as well as to make it more visually appealing. 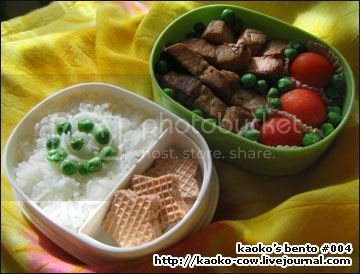 The top tier is made of steamed rice crowned with little green peas because it looked so lonely plain. And on the side, I added little chocolate wafers (Nissin Choco Wafers!!!) that I cut into little stars. Yay for cookie cutters! Marinate the tuna cubes in the mirin and soy sauce for about 30 minutes. Then, skewer the tuna cubes, alternating with spring onions. Grill until just done, leaving the center moist. Brush the kebabs with the leftover marinade while grilling. Easy-peasy right?